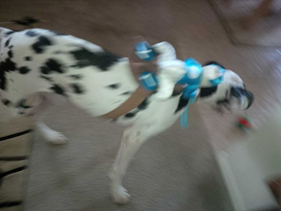 I now know, this year, that we will not have a Halloween outfit on the big dog. Nope. Nada. Ain’t gonna happen. I thought, OOH! Finally! I can put something on her and wow, will that big dog make an impact on a fun holiday. We were going to have nothing of it. So, I started with traditional. A cute turtle. and then Ralph was going to be a hare. Right, get it? Yeah you do. Geniuses. I found mine at TJ Maxx, but a similar one is out there. It was like I was torturing her. WHAT IS THIS ON ME? OMG! GET IT OFF. and then it was slip sliding everywhere, and let’s not even GET INTO that the head is a hoodie and not covering this dogs ears are a commandment, not a choice. So I moved on, eschewed that my dog would have a premium outfit. 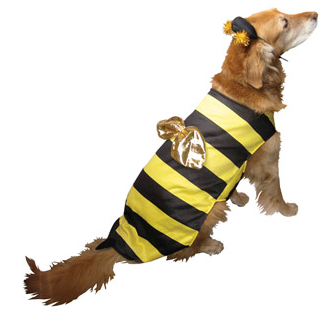 Ralph has a bee costume…so PENNY can have a bee costume. Right? Right! I found this one at Walmart, cheap, easy, not out too much…I’m destined to have a doggy Halloween after all…has has no hoodie, she likes her tee shirt at least…so…let’s tryyyy….nope. No pictures could even be taken. Forget it. Target. Oh, how I love how you drain my wallet when all I need is a gallon of milk. Here we go! 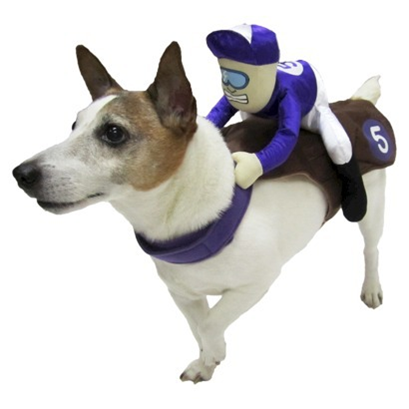 My dog is a horse and here is a jockey! WIN WIN WIN! Plus it’s like a harness and it’s not overburdensome and WOW, just so cute. Until she tries to shake it off with the intensity of a thousand suns. 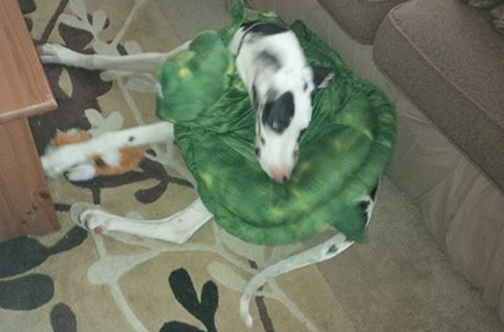 Happy Halloween everyone, Penny will be a….Great Dane.